Warm-up/entry activity devised for 11th graders, so they get to know or clarify some concepts, reasons why people emigrate,problems they may find in the host country and possible ways of minimizing adaptation problems. 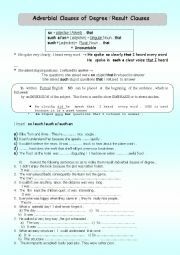 Information on the structure and examples of Conditional sentences type 0,I,II and III + practice exercises.Hope it will be useful! I find this song of the BlackEyed Peas very useful to help students reflect and guide them to a follow-uyp discussion/debate on some of today�s social,environmental, cutural and political issues. One of my students even commented this song is like a modern prayer. 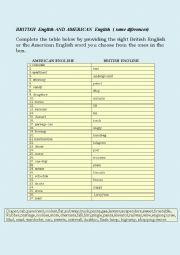 List of some of the most common verbs and phrases + gap filling in exercises. 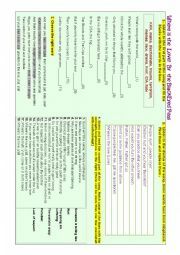 I hope this worksheet can be useful. I usually project the first three pages as introductory information and only give to the students the last two so they practice the exercises. The use of "SO" and "SUCH" +that to stress or show emphasis . 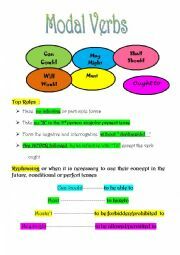 This activity is mainly intended for 11th graders. The song What a Wonderful World can be usedas a springboard for a clas discussion on today�s most serious environmental problems. 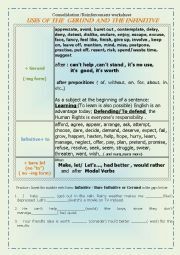 I devised this documente mainly to help 10th graders, so they would have a general and immediate perspective of the main verb tenses. Sorry! 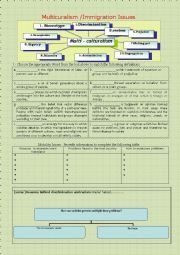 This worksheet wasn�t properly titled, I�ve got another about multiculturalism issues that I�ll try to publish soon. In Portuguese schools a simplified version of Egar Allen Poe�s short-story "The Mask of the Red Death" is adopted as Extensive Reading. I present it as a summary/recapitulation before the reading check test about this story. 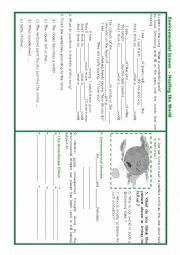 I use this ppt to introduce Maya Angelou�s short stories "Names " or "Visit to the Dentist", with some complementary background information on slavery in the USA. Three pages in which you can have an overview on the different types of Passive. Needless to say this ppt will be more useful to more proficient students.